An inductive bluetooth ball-pen offers maximal hidden communication solutions to micro earpiece users. Bluetooth pen consisit of bluetooth module, insulating inductive coil, microphone and rechargeable battery. The bluetooth module contact to mobile phone wirelessly within 1-2 meters. The alternating current from bluetooth module flows throught inductive coil. The coil creates a magnetic field and drive receiving coil inside an invisible earpiece within magnetic field. The radius of magnetic field creates by inductive coil is approx 30-40cm. You can move inductive bluetooth ball-pen freely. 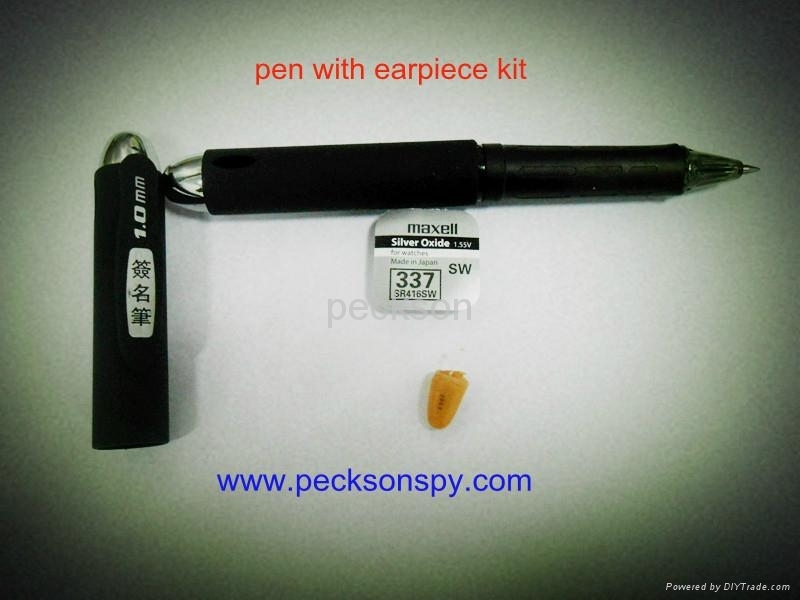 If invisible earpiece is within magnetic filed, you can always hear clear sounds. The ball-pen also offers normal writing in black color. You can replace old ball-pen core after ink used off. Both of bluetooth switch and microphone are hide under pen clip. You can operate bluetooth module by press clip ball. The tiny blue indicator will blinks and shows status. You can see indicator clearly under dark light.